In every classroom, we’ve been reading and retelling folktales, and one of the favorites has been The 3 Little Pigs. We decided to use an afternoon music group to see if the children would be interested in creating a sound script that could liven up their story, and, maybe, encourage some of the children to ask to act out the story. Children agreed that a wolf has a low voice, and the pigs had higher voices so everyone acted accordingly, and we told the story with sounds while a teacher narrated (read the book). The chickadee class has been retelling the story spontaneously ever since. Not all the children were in the first music group experience, but now everyone uses the same sound effects for their play. Children choose roles now, and some are the audience and musicians, watching with the narrator as the story is acted out. 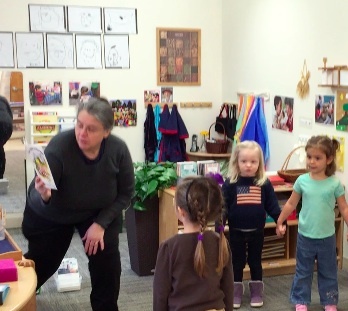 Whenever the book is chosen at reading times, a crowd comes over and requests for the chance to act out the story are often made. And we’ve been watching as many children build “houses” in the block area, create pretend games, and tell stories. Giving children opportunities to put stories into action (have a play) and use their growing pretend skills adds enthusiasm and excitement to our shared readings of familiar stories. A play gives structure and action to the parts of a story or book that we teachers would like children to be able to identify – titles, authors, characters, narrators, etc. in a way that is engaging and meaningful for just about everyone. Music helps represent the characters and actions in a way that is both clear and memorable to the actors. In working together and taking a part, children come to realize that there are times when working together leads to a different, and sometimes more interesting, result than working alone. They also begin to understand that practicing improves the result, and that it is often worthwhile to try more than once and develop ideas and skills together. But one of the best by-products of these experiences is that children create and take ownership of the play with all its parts on their own and discover they can accomplish great things – in their pretend, in their own stories, and with stories that everyone knows and loves. This entry was posted in Chickadees, Curriculum, Education, Literacy, Play and tagged chickadee, children, curriculum, education, learning, play, preschool on February 8, 2015 by Katrina Selawsky. Early experiences have an impact on physical development and on brain development. A child who moves too quickly or is always running may have been an early walker and had less time engaged in weight -bearing activities earlier in development. Using speed can compensate for having less control. Children think and learn through physical activity. They need many varied opportunities to take action in their environment, experiencing a full range of tactile and sensory experiences. 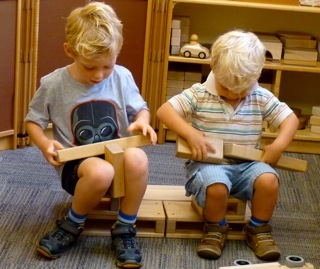 Children need opportunities to use open-ended materials over time that can be used in diverse and increasingly complex ways. 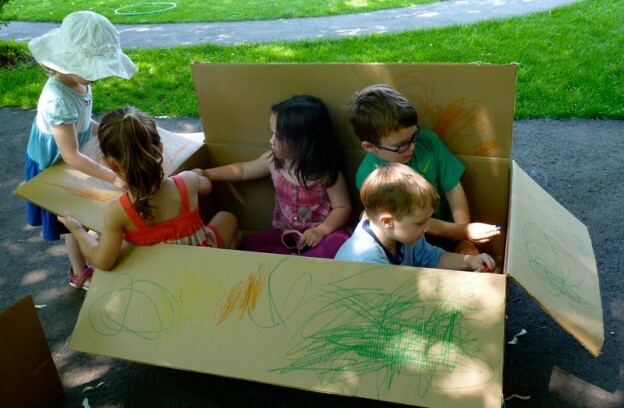 These materials require children to problem-solve and create their own meaningful experiences, so that play ideas come from each child’s imagination and not from an external source. Offer materials that require finger work and strength – playdough, putty, clay, crayons (more than markers that require very little pressure), sand, fingerpaint, pipettes, tongs, etc. Think about the amount of time children are spending with ipads or other technology. Using these materials too much takes time and interest away from more foundational activities. This entry was posted in Development, Education, Philosophy, Play and tagged children, curriculum, development, education, learning, play on November 22, 2014 by Katrina Selawsky.